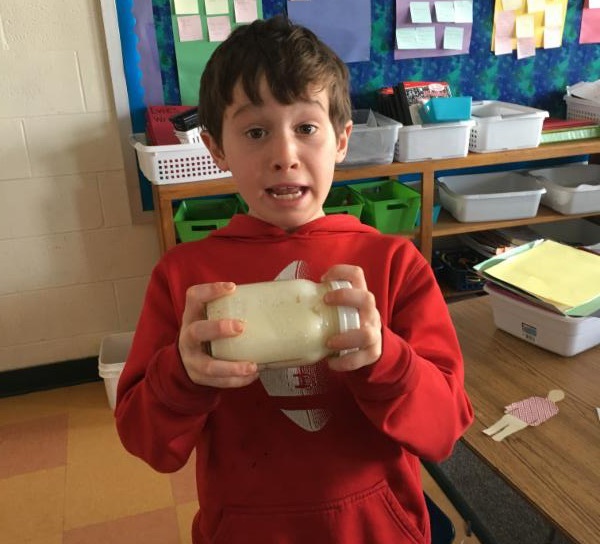 & Springing into Spring with News from our Classrooms! 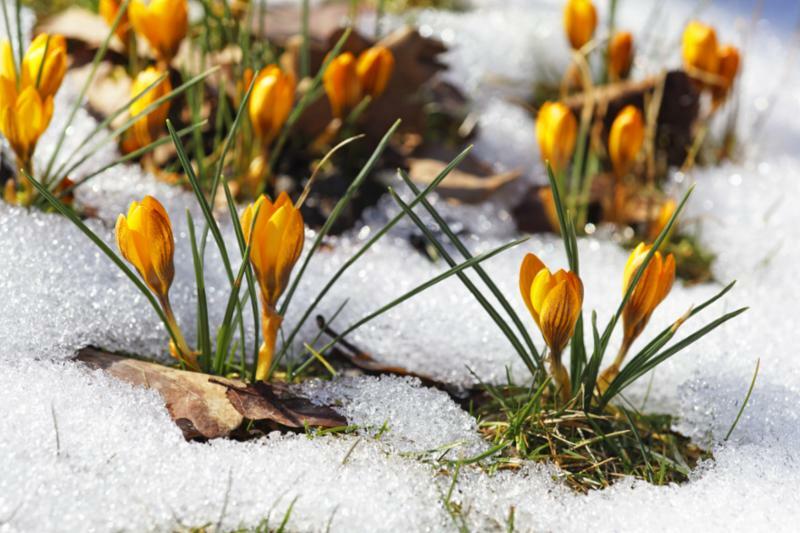 I hope this newsletter finds you enjoying the lengthening days of spring. Even though the temperatures have been slow to rise, the sun is getting stronger and the snow piles are shrinking. Hopefully we are done with winter storms and at this point our last day of school is Wednesday, June 18th. 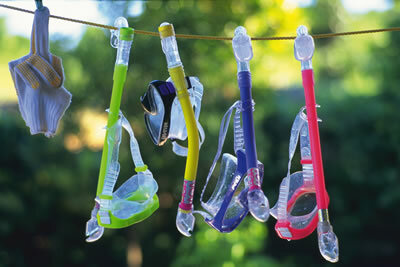 Please remember to take a moment to check the lost and found for any missing winter gear . Please also remember to take your sleds home. 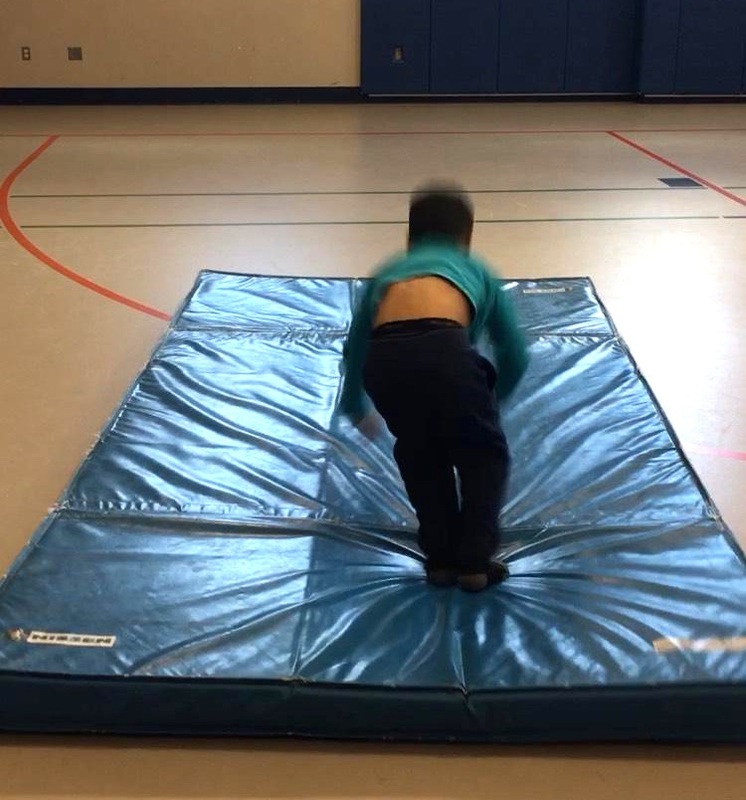 Our parent teacher conference day is Friday, April 12th. 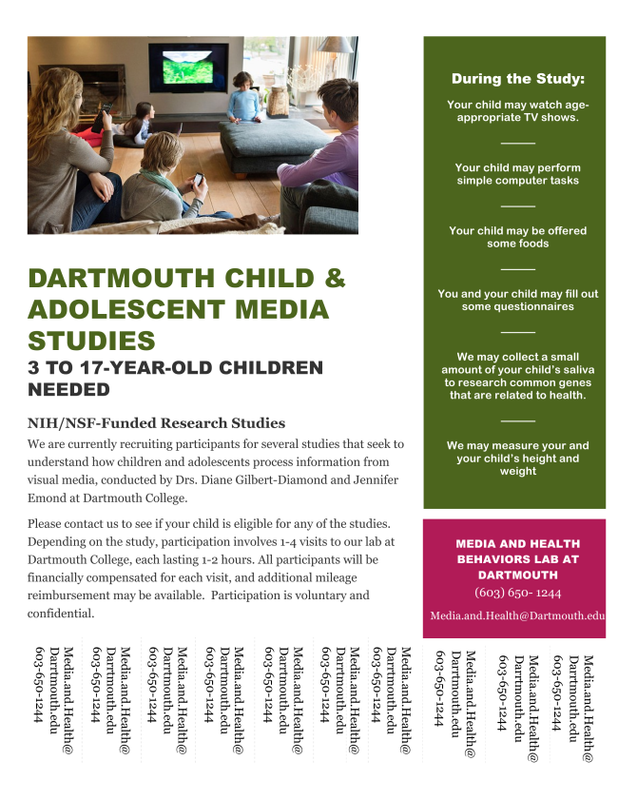 If you have not yet scheduled a conference with your child's teacher, please contact the school so we can arrange a time to meet. 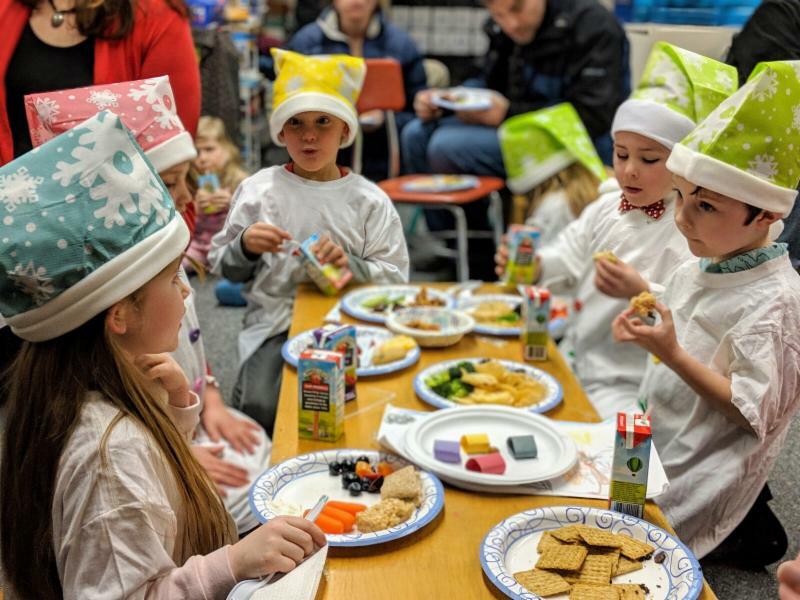 Parent conferences are an important opportunity to learn about your child's progress and connect with their classroom. Thank you for your time and I hope you enjoy this look into our classrooms. 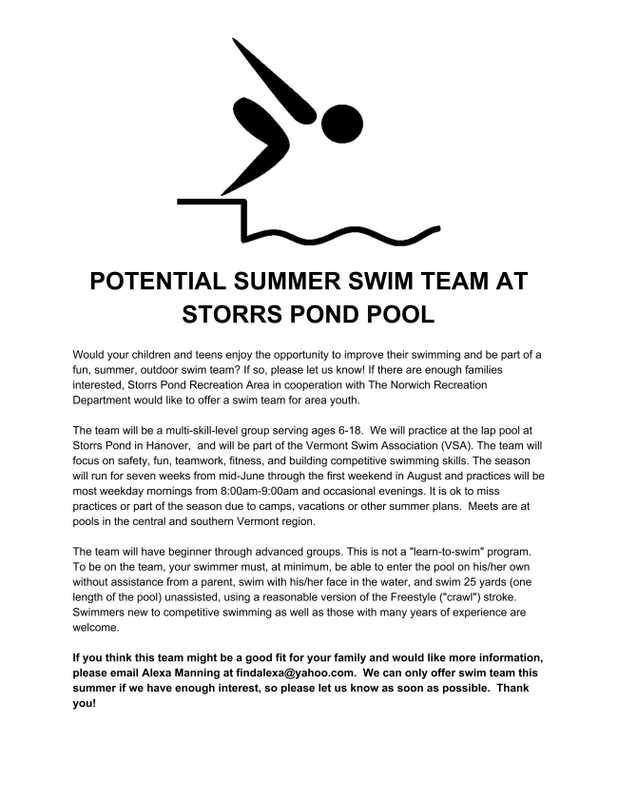 If you have any questions, please do not hesitate to contact the school. January and February were very busy months. 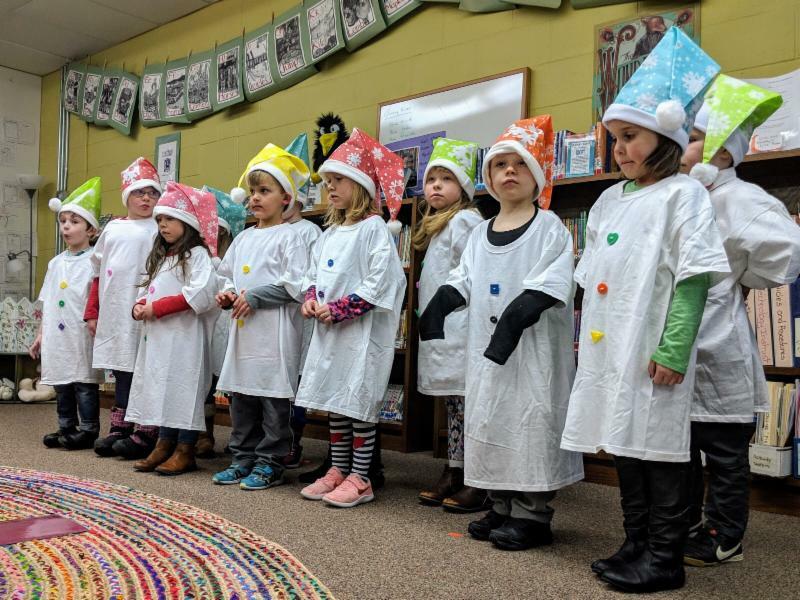 Our Literacy study was snow and the children learned lot of snow songs, poems and dances. They had a wonderful “Snow Show” with their families. The children also became engineers learning about balance, force and motion with pull and dish. The children made marble plate mazes and marble runs for the school science fair. 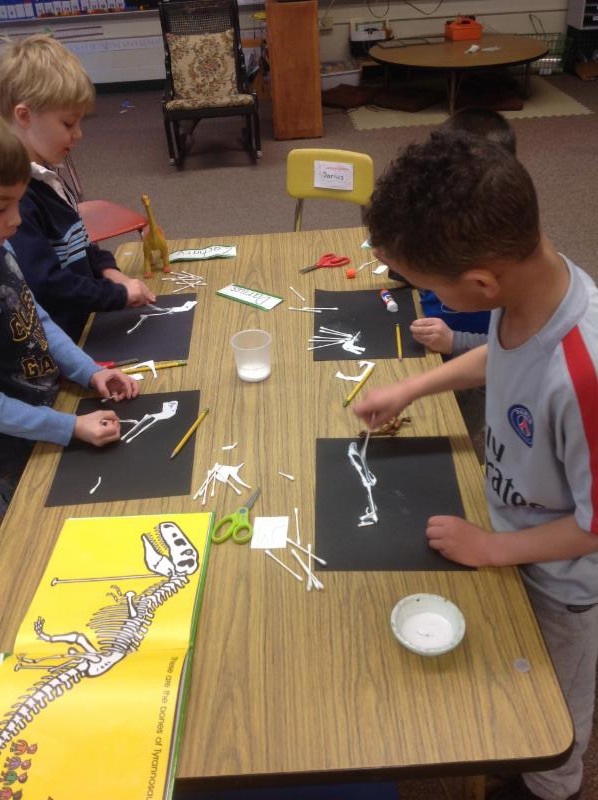 Our class has been "digging" in to our new Dinosaur Unit! We have a variety of songs and poems we are learning, which help us retain the information about dinosaurs and Paleontologists in a fun way. Below is an example of a poem we recite to help us understand what the job of a Paleontologist entails. I study bones and fossils from creatures long ago. I put the bones together, a dinosaur you will see. This is how they looked, come learn along with me! 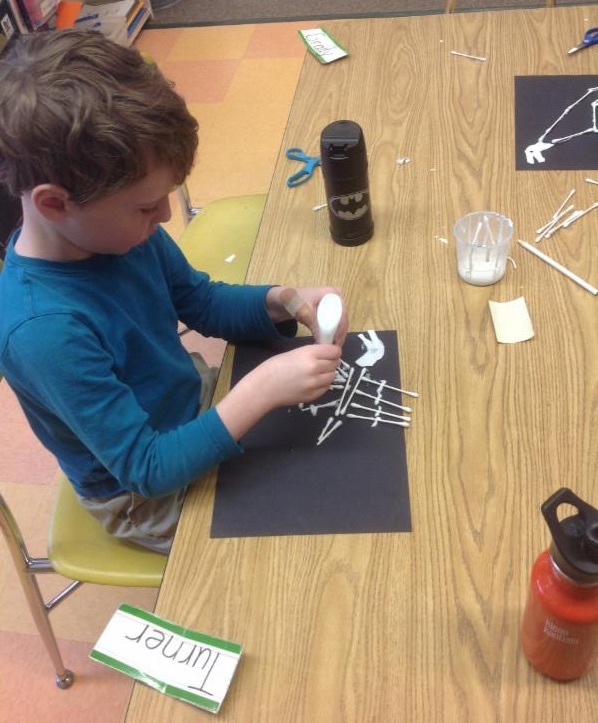 We have made our own fossils out of two different mediums, salt dough, and q-tip fossils, which are mounted on black paper. In the next few weeks as you pass by our classroom you will see a "Dinosaur Museum" begin to evolve. Om! 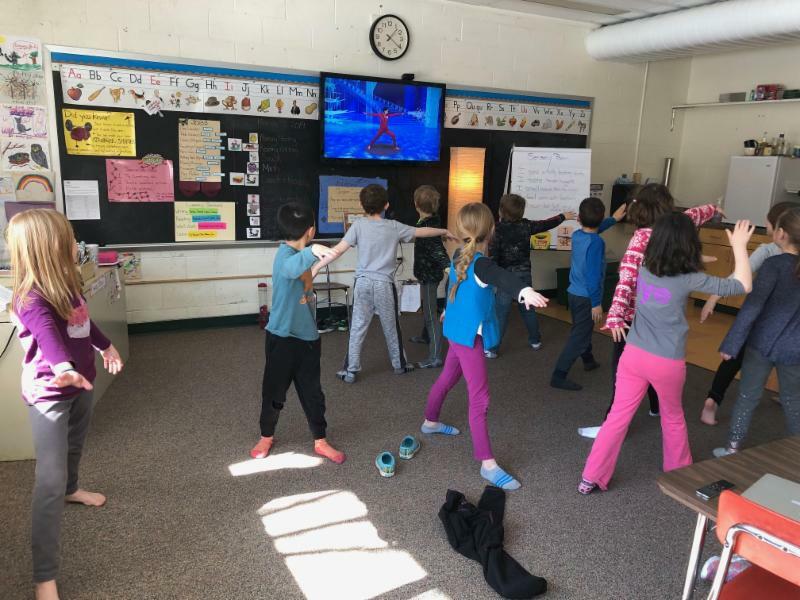 Ms. Oliver's class has been practicing yoga daily, following the guided instruction provided by Cosmic Kids Yoga online. 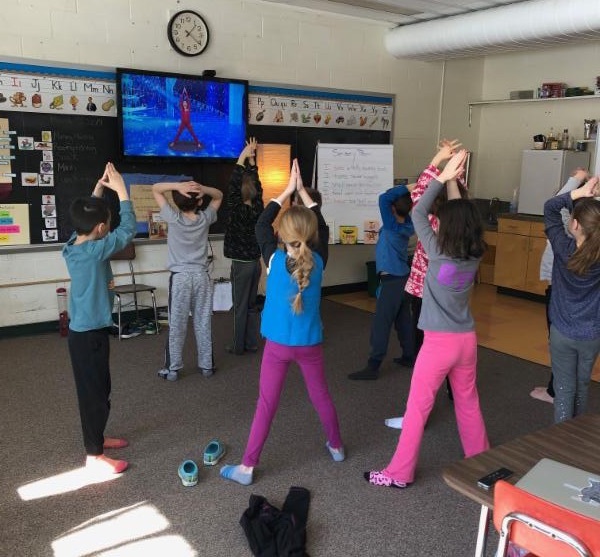 The program combines classic yoga poses with storylines based on children's stories (everything from Frozen to Harry Potter). 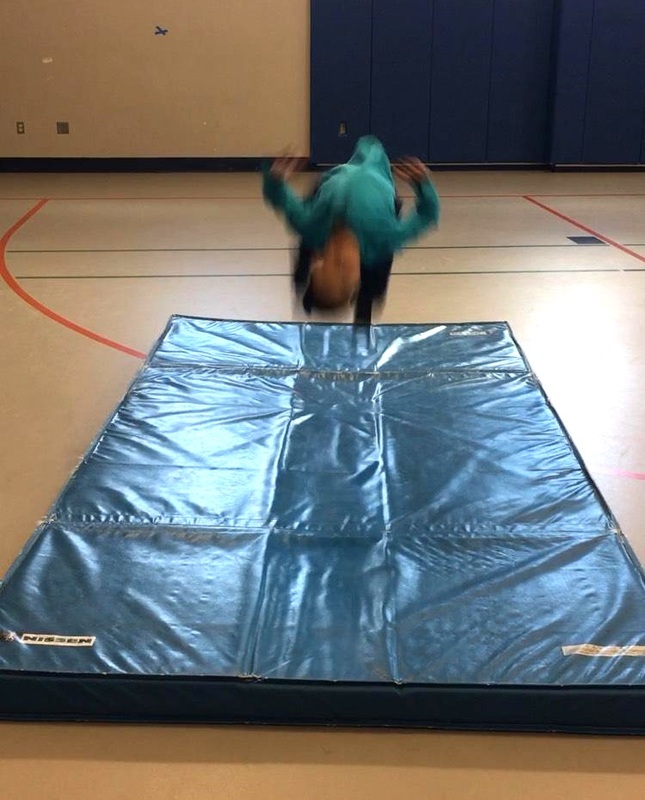 We have been practicing for 10-12 minutes in the afternoon. 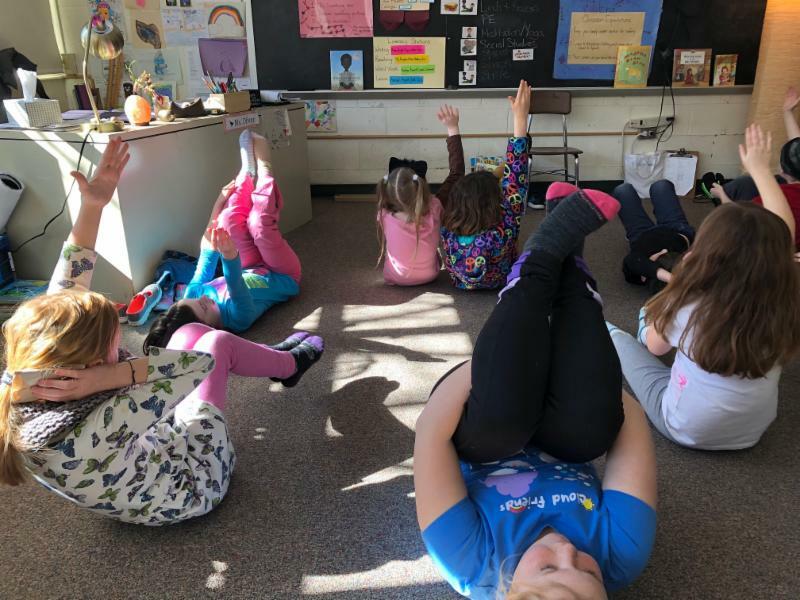 Students seem to really enjoy the good stretch before we finish our last academics of the day. We are hoping when the warmer, drier weather arrives, we might get to practice some yoga under the sun! 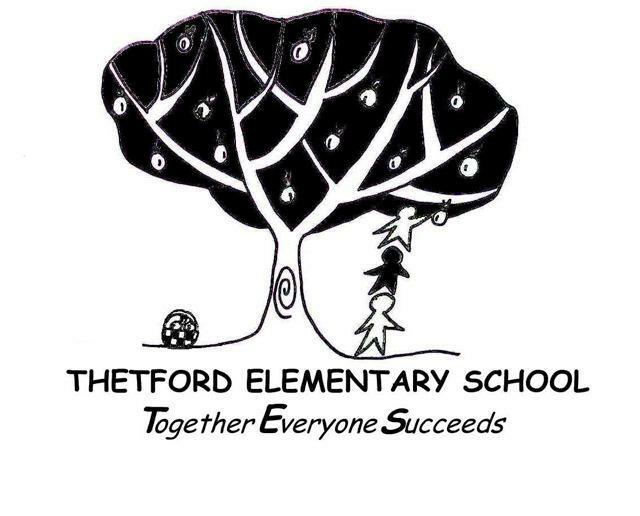 Ms. Kate's class really enjoyed finishing up their unit on Life in Thetford 150 years ago. Over the course of the unit they read several pictures books that explored what life was like 150 years ago and talked about how these books matched up to life in Thetford during that time period. The class enjoyed experimenting with school materials from those days like chalk slates and using quill pens to write. They also enjoyed playing with old-fashioned toys such as marbles, graces, pick up sticks, tiddly winks, and jacks. They tried making paper dolls dressed like children from that time period. 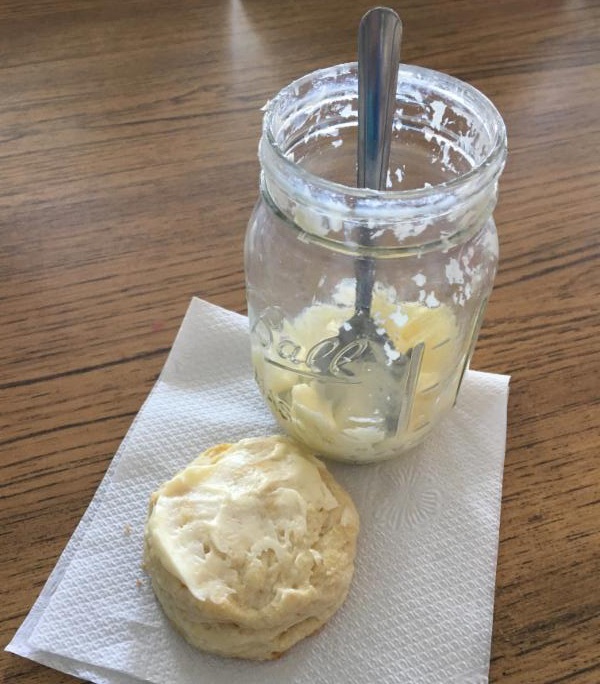 Finally, they really enjoyed making both biscuits and homemade butter and eating both for afternoon snack one day. They are now moving into writing opinion pieces about whether or not they would have wanted to live 150 years ago themselves. 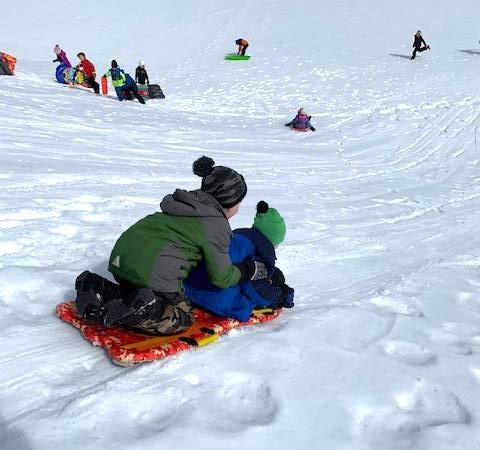 As a firm but loving farewell to winter, the entire K-2 wing spent an afternoon sledding on the upper soccer hill at Thetford Academy. 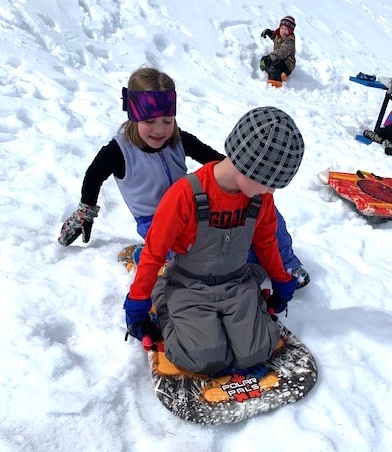 As the sunshine peeked through the clouds and temperatures reached into the 50's, extra layers were removed and it felt almost like summer (minus the snow and sleds and hats and boots.) 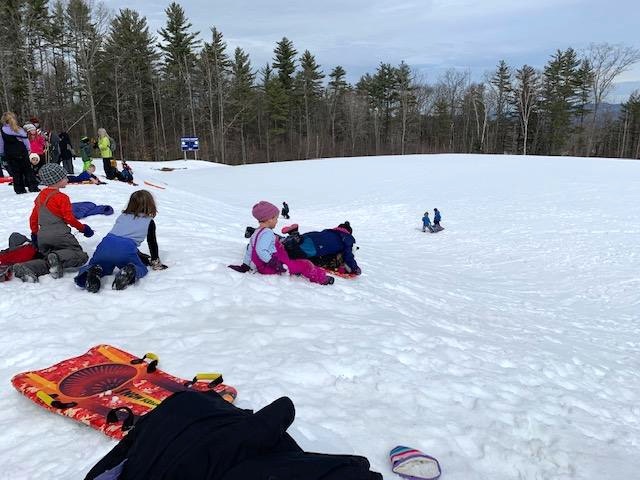 After only a few runs on the hill just below the bleachers, students were itching to get their sleds to the tippy-top and start their runs at the tree line. 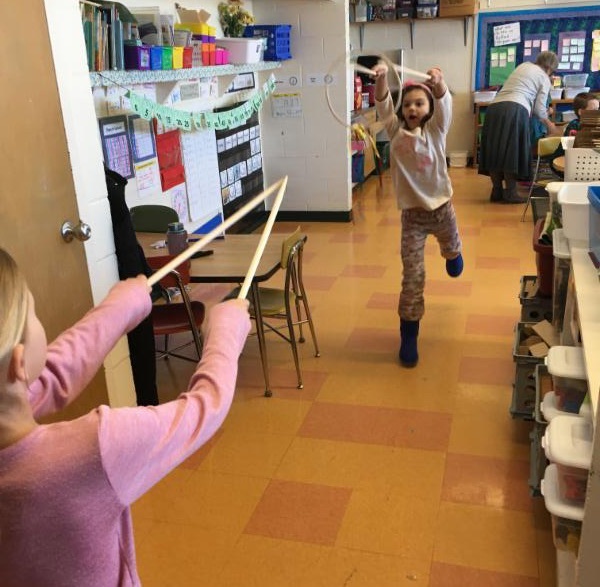 Like a bunch of penguins zipping down to water, students enjoyed the hill for over an hour making trains, hitting jumps, and breaking distance records. 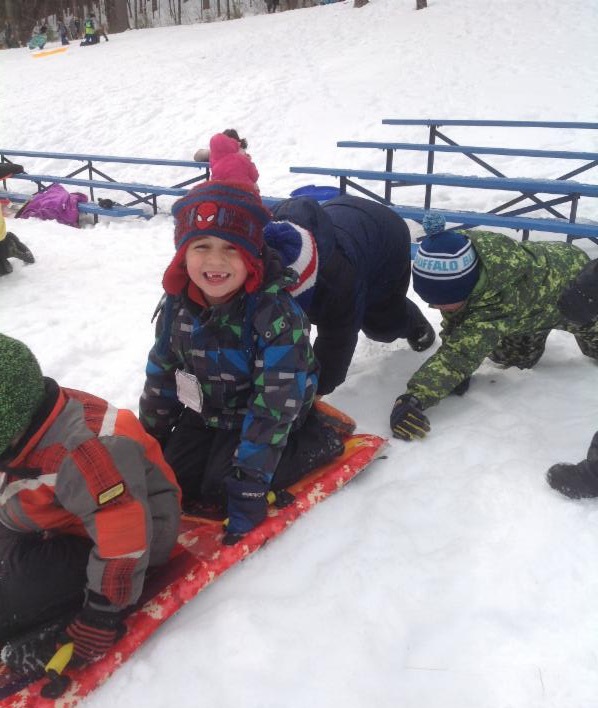 After over an hour of sledding students returned to school sweaty, tired, and happy. experimenting with electricity and magnetism. 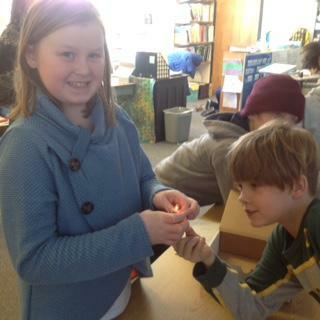 Shown here are students trying to complete a circuit to light a bulb, using a battery and copper wire. 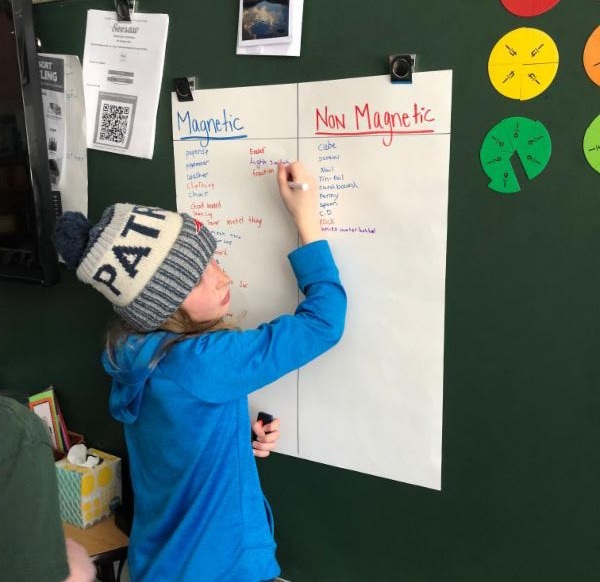 They have also been using magnets to attract or repel other magnets, seeing that magnets have a north and south pole (just like the earth which acts like a giant magnet and is why a compass works.) 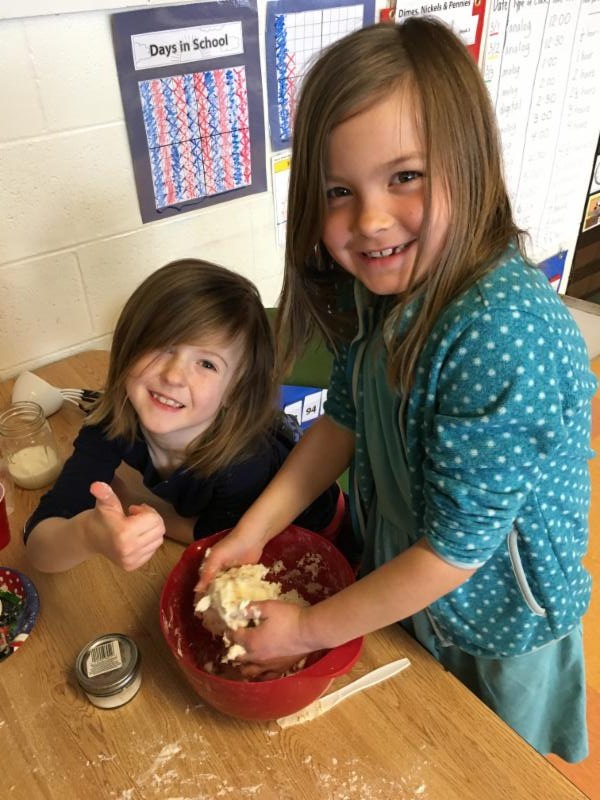 The children look forward each day to more of these science activities. Ms. Bennett’s class enjoys fun and relaxing morning meetings. 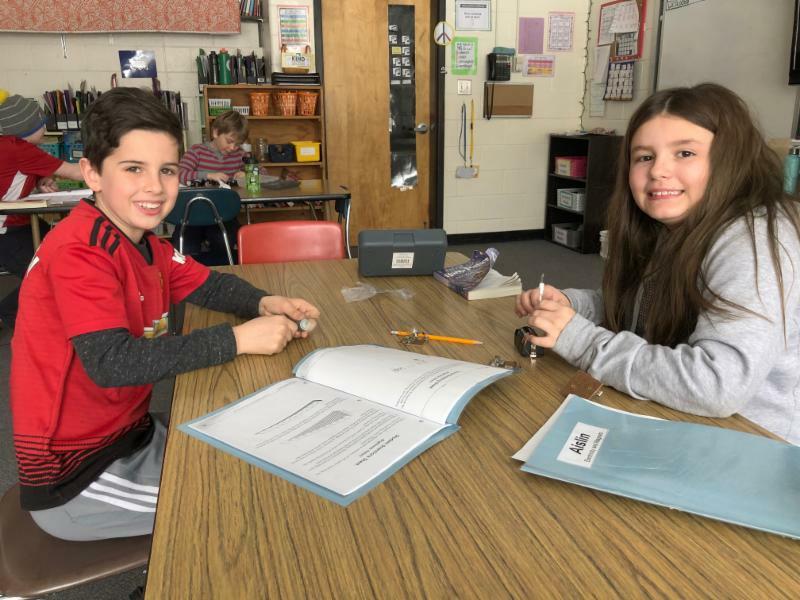 After going over the schedule for the day, the students often share books they are reading or games they have created. 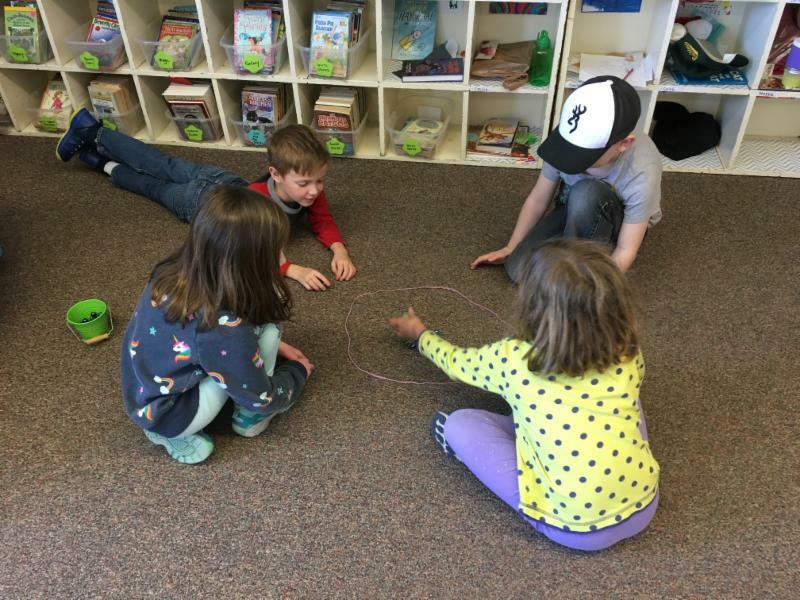 They have learned to be good listeners for each other, and often a topic is brought up, and everyone participates in a group discussion. 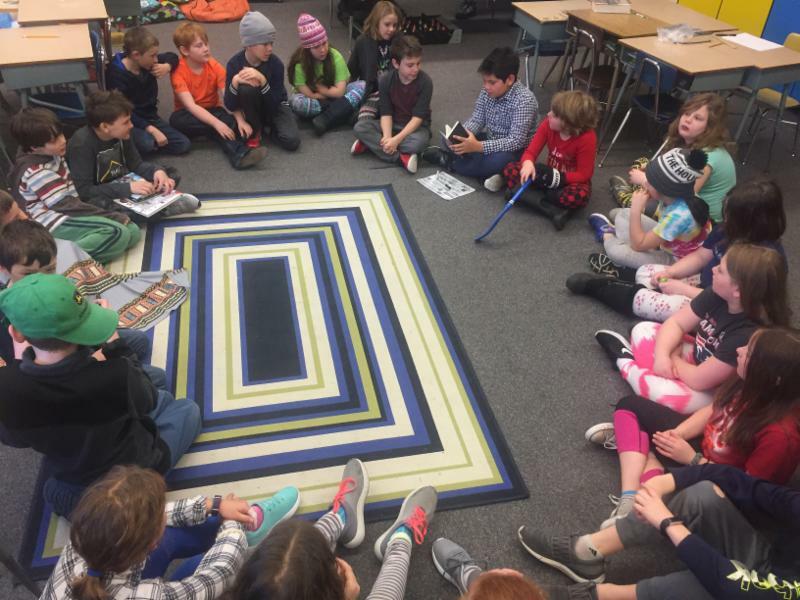 Morning meetings are a great way to start the day. 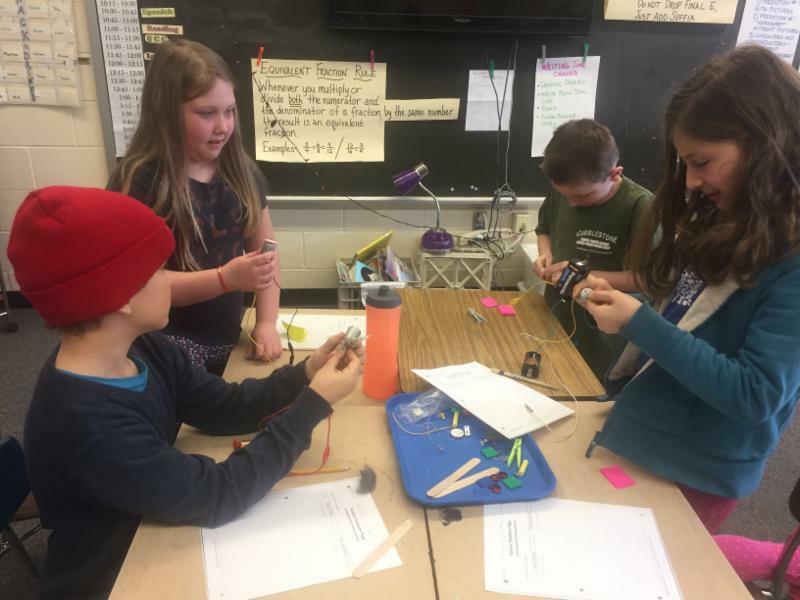 In Ms. Bennett’s 3/4 class, students have been exploring electricity. 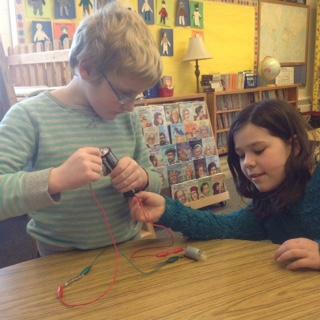 They used batteries, motors and wires to create a fan and power up lightbulbs. 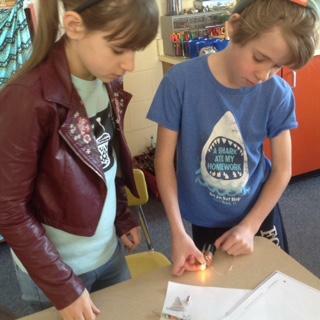 They have learned about complete circuits,series circuits, conductors and insulators. 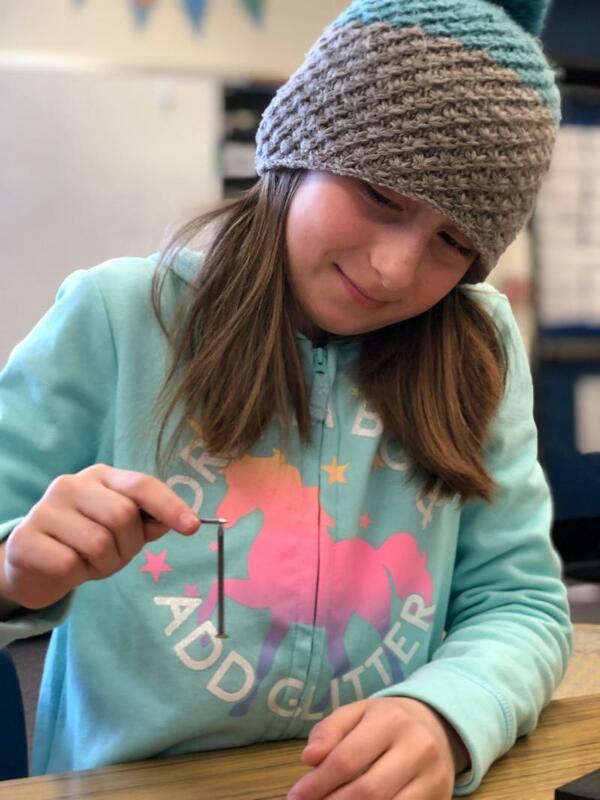 Ms. Mousley's 3rd and 4th grade class just spent the last two weeks learning all about magnets. 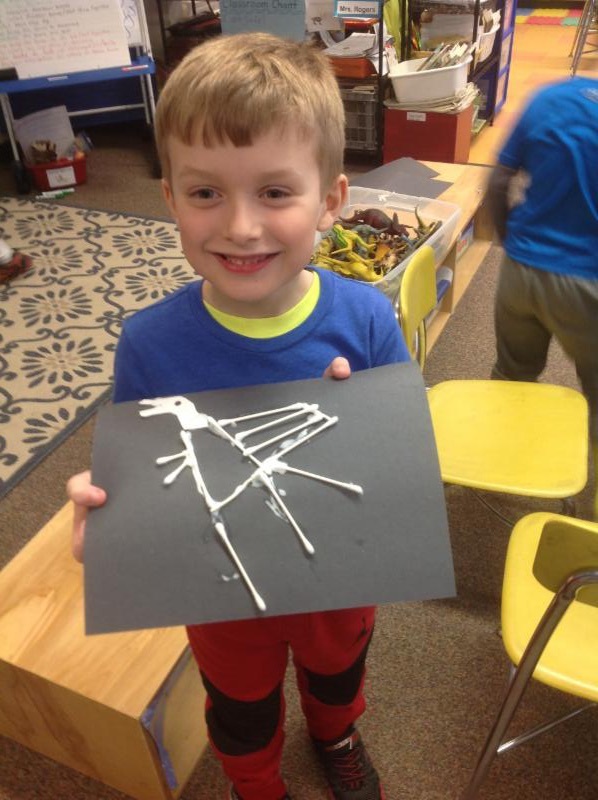 We had fun exploring with all different strengths and shapes of magnets. We created our own compasses and built electromagnets. 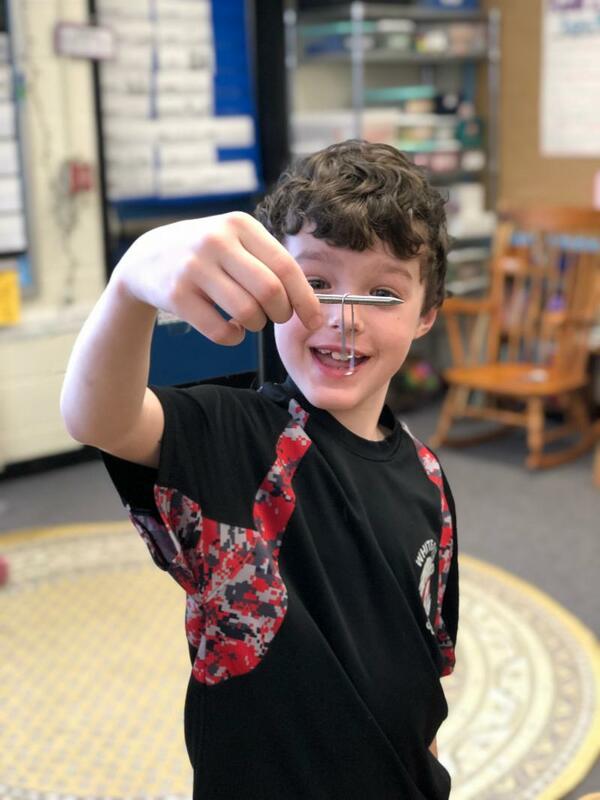 The class made many connections between electricity and magnets in our explorations. We will be moving on to study rocks and minerals next. In writing we have finished our reports on famous people as well as our portraits. We have started learning about the painted essay and will be using it to help us do some opinion writing this spring. 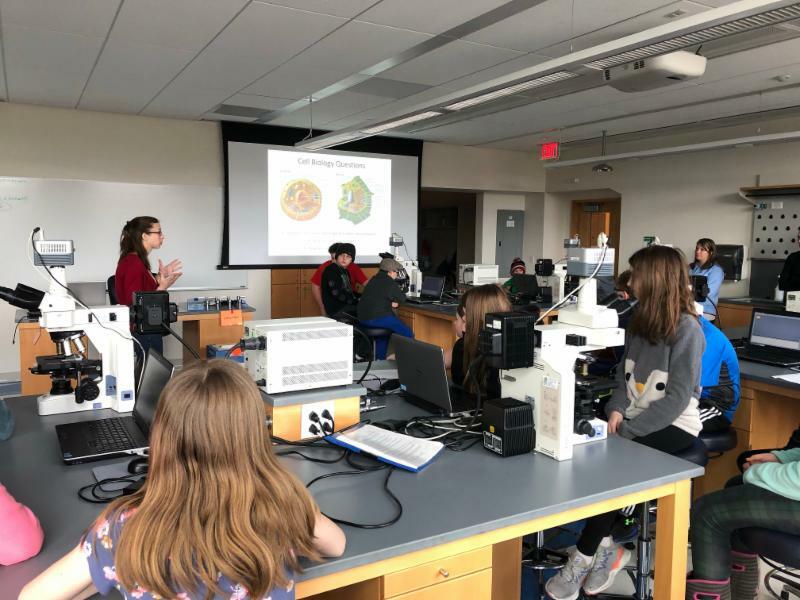 Fifth graders enjoyed a recent trip to the Dartmouth Life Sciences building. 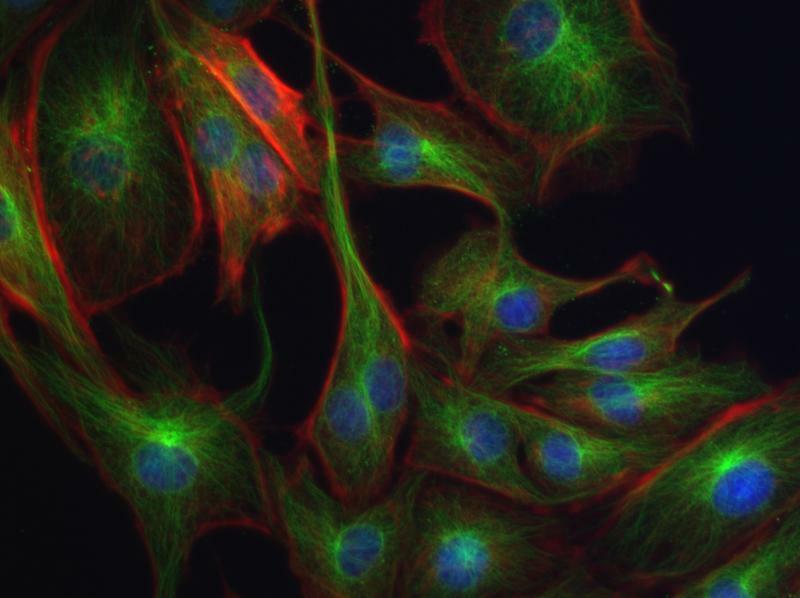 We visited a microscopy lab along with the rooftop greenhouse. 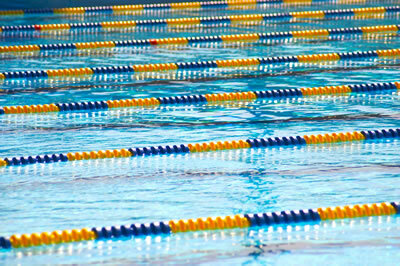 It was a nice dose of summer on a dreary March day! 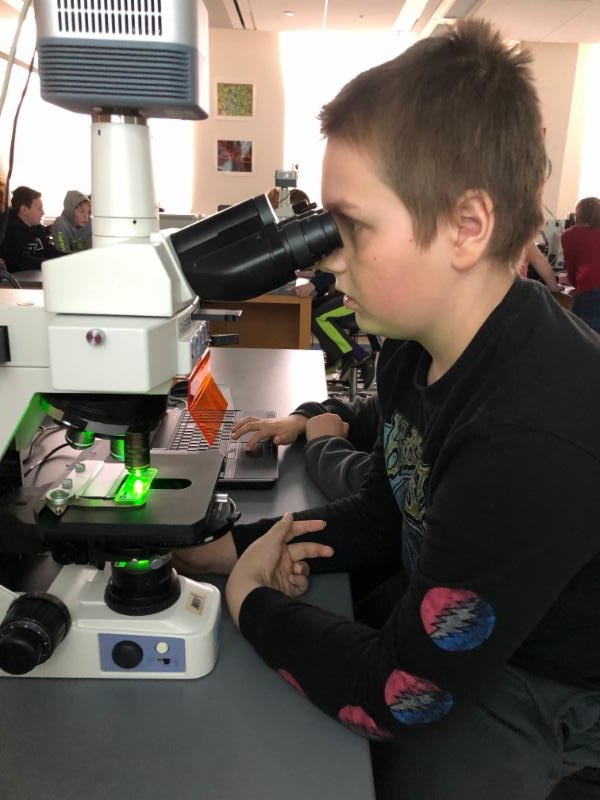 This trip complemented our ongoing science unit focused on micrscopes and cells. We are also wrapping up our big math unit on multiplication and division of whole and decimal numbers, as well as a short study of the 13 colonies. Our unit on the causes leading up to the American Revolution starts soon! 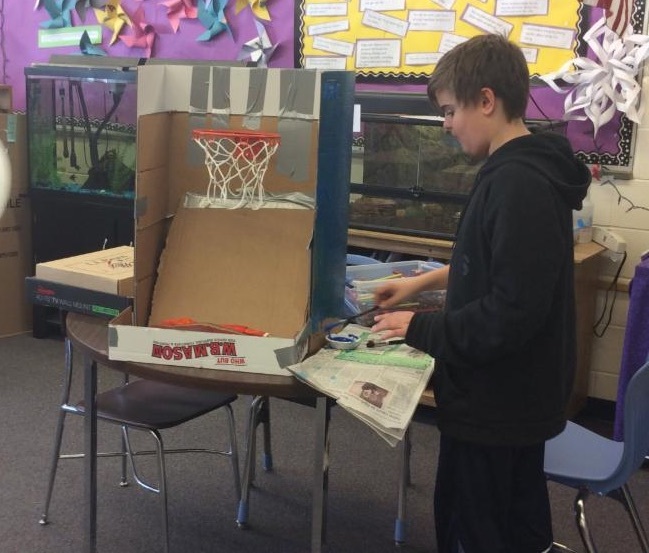 As part of our Physics and Engineering unit, sixth graders have been hard at work designing and constructing games for our Cardboard Arcade. This project was inspired by Caine's Arcade (look it up on YouTube!) which has become a national engineering design project for schools. 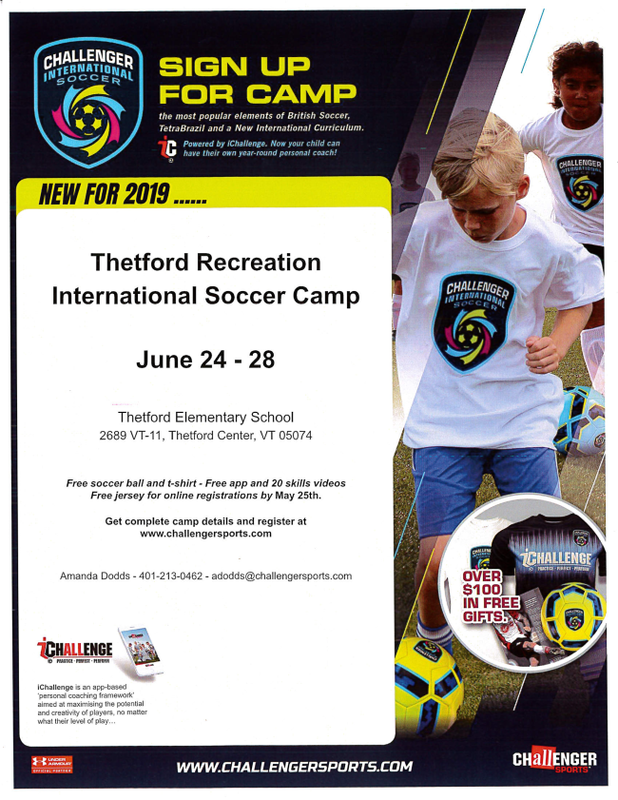 We are looking forward to inviting the school community and families in to play! 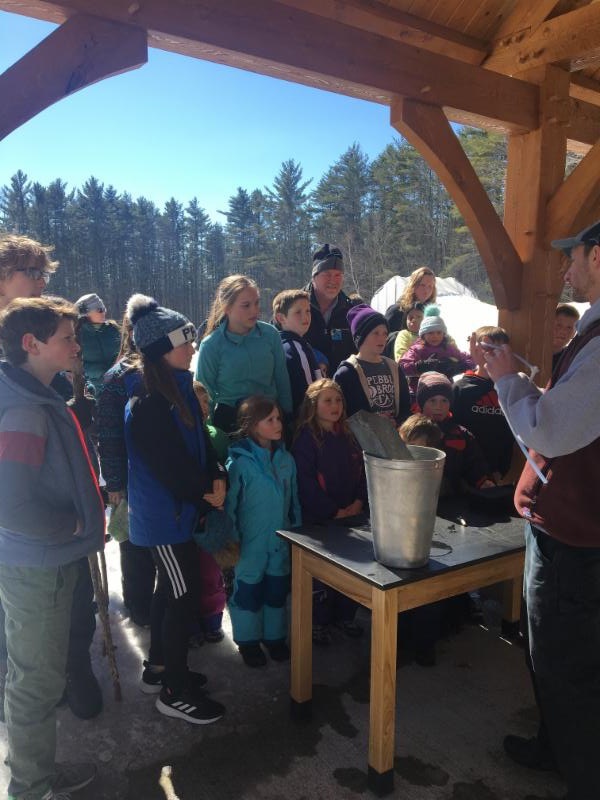 We have also welcomed spring by visiting the TA Sugarhouse with our Kindergarten buddies. 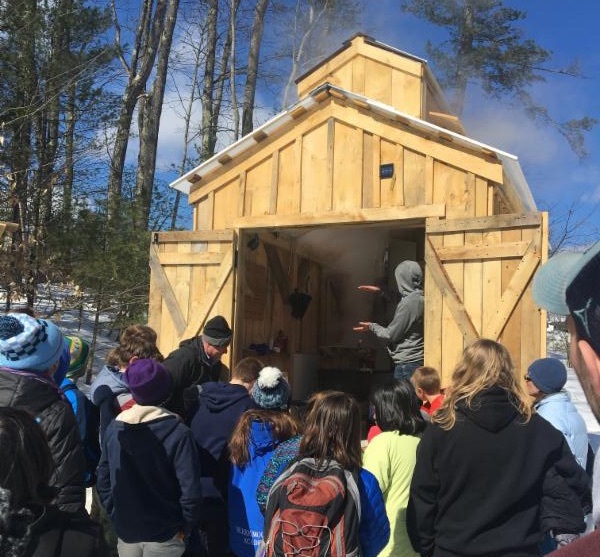 A big thank you to Scott Ellis and his knowledgeable students for hosting wonderful afternoons outside and teaching us all about the sugaring process! 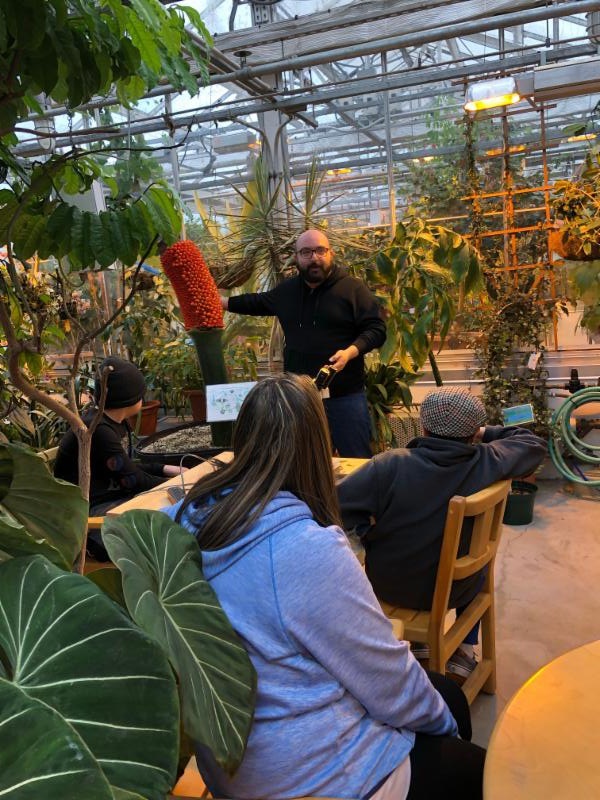 This was a great opportunity to get our sixth graders onto the TA campus while having a chance to spend time with buddies and become familiar with the outdoor education program. 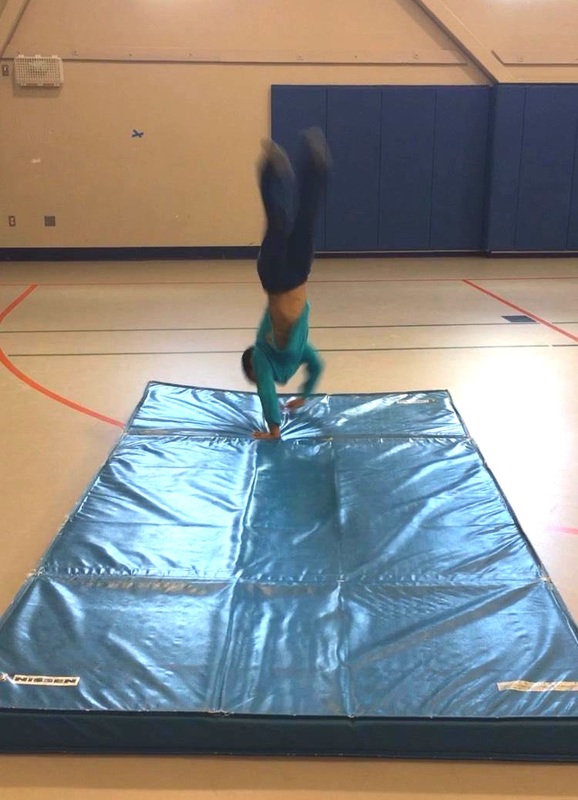 I hope everyone that participated in the UVTA Passport to Winter Fun program had a blast and tried new things. 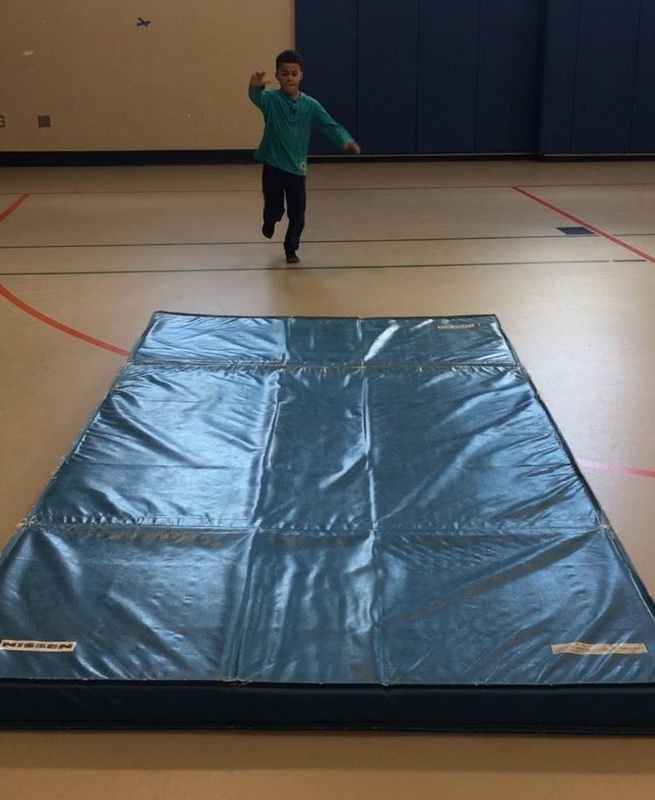 Jump Rope for Heart is fast approaching, stay tuned! 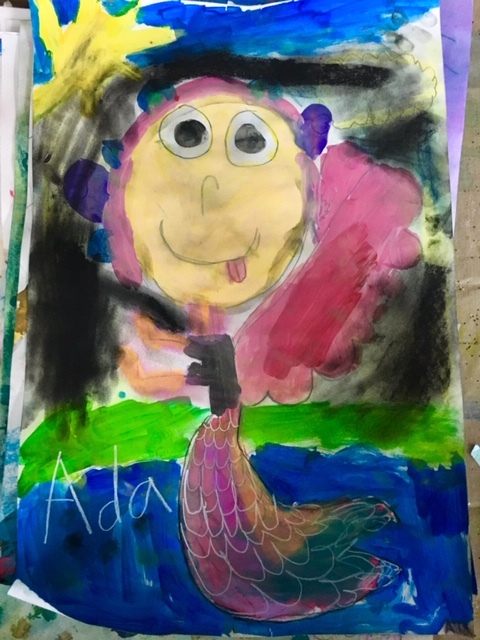 In the primary wing, students created painted paper collages illustrating familiar fairy tales. Students learned how to create the illusion of perspective when objects are drawn larger in the foreground and smaller in the background. 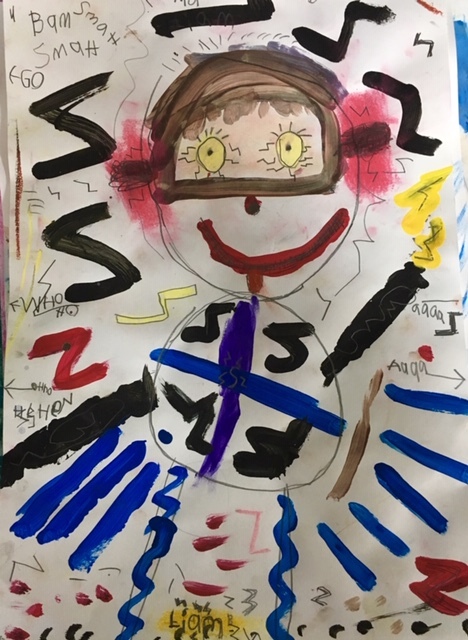 More recently, students have been working on “Selfie Portrait Superheroes”, in which they were asked to choose a superpower. They used lines and colors in the background to evoke the feelings they’d have with those superpowers. 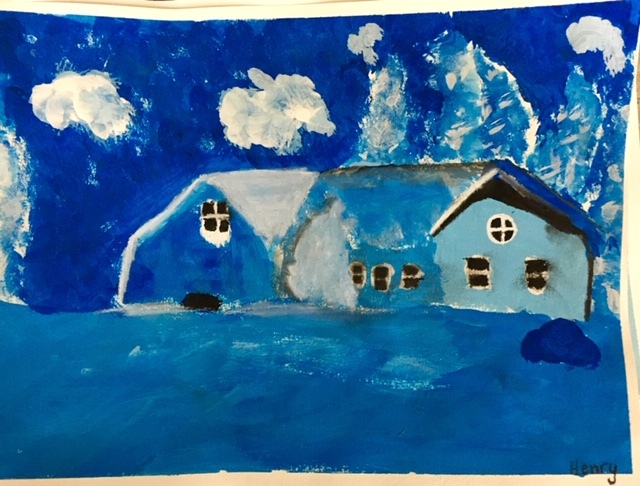 3rd and 4th grade students just finished wonderful winter paintings illustrating how value can create the illusion of dimension (the art element: form) and depth (space). 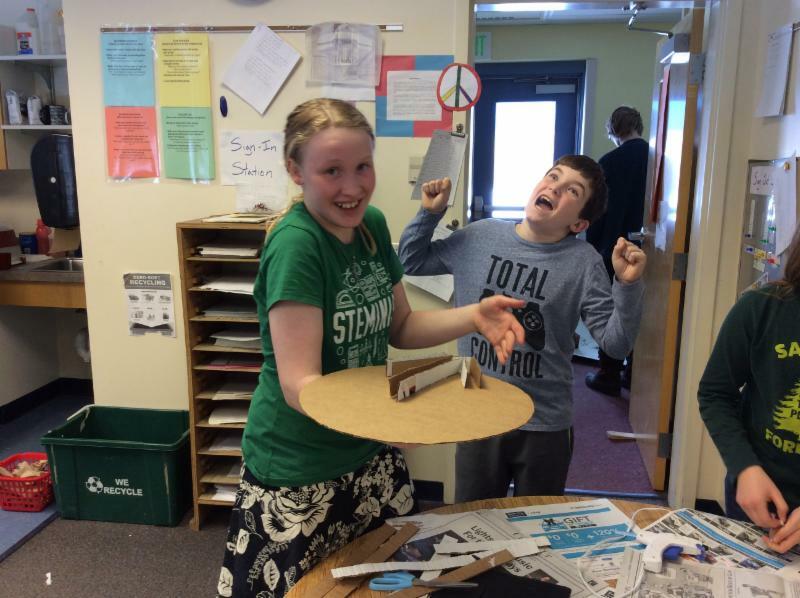 They are now are working on recycled object sculpture, in which they challenge themselves to use a new technique (home-made paper clay) to plan and sculpt buildings inspired by Dr. Seuss architecture. 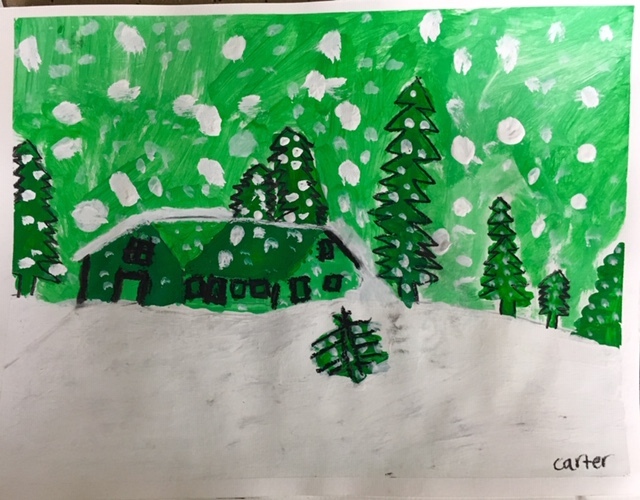 The 5th graders recently finished work on monochromatic paintings of winter scenes. 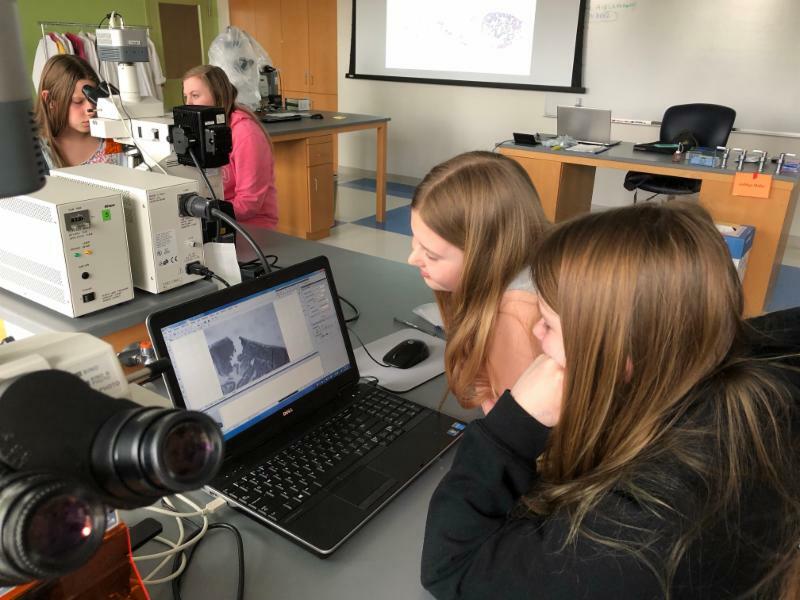 This project required them to sketch an image inspired by their choice of black and white photos, then paint, and finally add shading and tinting details with black and white chalk pencil. They were amazed to see how just a touch of white or black made their images pop. The 6th graders completed painted hand poems at the beginning of this trimester. They are now divided into several groups during each art class: one group started on the 6th grade traditional project of creating plaster hand sculptures, another group worked on 1-point perspective drawing, and a third group practiced figure drawing after watching several demonstration videos on proportions.